Birthday Parties are a special benefit available only to Autrey Mill Members (Family membership level). Each party can accommodate 12 participants. A fee of $10 will be added for each additional participant. The party fee is $200. Request your program today! Children, and their favorite dolls or stuffed animals, enjoy a birthday tea party with tea and cookies. Activities and theme can be customized to your child’s age and interests. This party is designed for participants 5 years and up. Fairy tales and mysteries abound here at Autrey Mill. 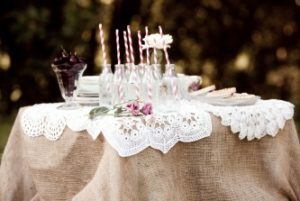 If your birthday girl chooses this magical fairy-themed party, she and her guests will make fairy-themed crafts, search for signs of fairies, and more. Fairy Parties are unavailable in June and July. 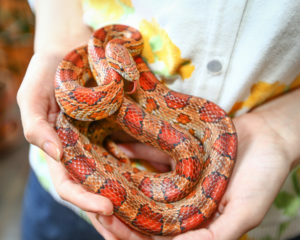 Birthday party participants will be entertained with a Reptile Show, animal feeding, animal themed craft, a hike along our trails, games and more! Activities and themes can be customized to suit the birthday girl’s/boy’s interests and age. This birthday party centers on our creek! 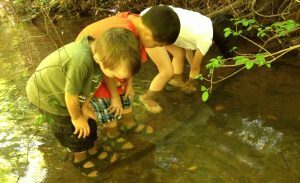 Participants will be guided on a creek hike, participate in catching (and releasing) fish and salamanders, play water games and more. This party is best suited for participants aged 7 and up and is available May to September. 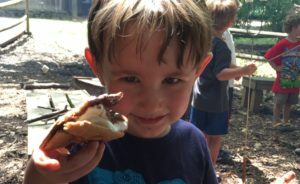 This exciting party option includes observational games while on a guided night hike, introductions to some of Autrey Mill’s nocturnal animals, camp fire s’mores and story time. This option is available during dusk, thus times may vary, but we are accommodating to your schedule. Night Hikes are unavailable in June and July.